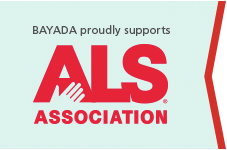 As a national partner of The ALS Association, BAYADA was proud to be a Platinum level sponsor of the 2014 National ALS Advocacy Day and Public Policy Conference in Washington, DC. The ALS Association Expo featured an Exhibitor Marketplace, a traditional exhibit area with information, equipment, and services that are vital to the health and wellbeing of people with ALS. BAYADA was one of eight exhibitors at the expo and the only home care provider. Every year, thousands of supporters go to Washington to advocate for policies specifically designed to accelerate the development of treatments for ALS. The federal government is the largest source of ALS research funding. 2014 marks the 75th anniversary of Lou Gehrig delivering one of the most memorable speeches in American history when he announced his ALS diagnoses from the field of Yankee Stadium. He lost his battle with ALS two years later and became the face of this devastating disease. Today, a person diagnosed with ALS has the same prognosis as Lou Gehrig did 75 years ago. We stand by The ALS Association in support of this very important mission. Please join the fight and make your voice heard. Learn more and become an advocate at www.alsa.org/advocacy.